In a large mixing bowl, combine flour, salt, ginger, cinnamon, cloves, nutmeg and cardamom. In a stand mixer, combine butter and sugar until pale in color. Whisk in eggs one at a time, then add in molasses. Stir in flour mixture gradually. Divide into three balls and cover in plastic wrap. Chill for at least one hour. Preheat oven to 350 degrees. Roll out one ball of dough onto a lightly floured surface or parchment paper, about 1/4 inch thick. If dough is sticky, incorporate more flour 1/4 cup at a time. Cut cookies with a cookie cutter and place 2-inches apart on a baking sheet lined with parchment paper. Bake for 12-14 minutes until the cookies are crisp and firm, but do not allow them to darken in color. Let cool on a wire rack before adding icing. To make the icing, place egg whites in a bowl. Stir in 1/2 teaspoon cream of tartar. Put powdered sugar in another bowl. Spoon powdered sugar into egg whites 1 tablespoon at a time. Stir — don’t whisk — until thoroughly incorporated. Repeat until icing holds its shape when you run a spoon through it. Icing should not be runny so it is easy to pipe. 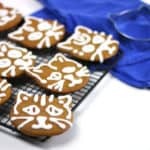 Add icing to piping bags and use to decorate cookies.